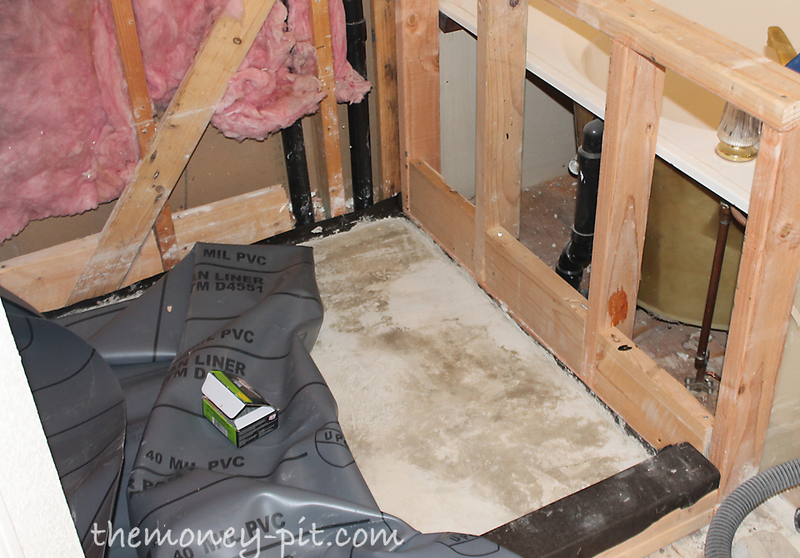 We are approaching the one week mark on the bathroom makeover and so far I have tackled demo, reinforcing the floors and walls, and now it is time to deal with the shower pan. 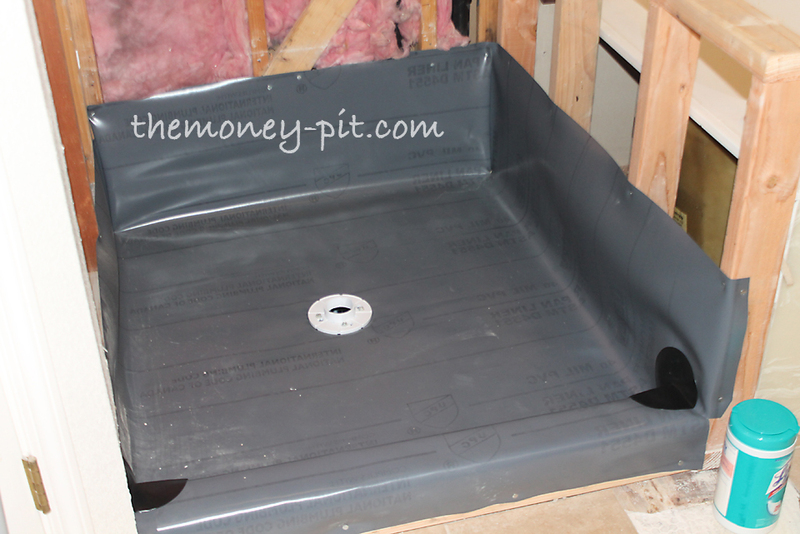 One of the options when installing a tile shower is to use a pre-made fiberglass shower pan (which is exactly what I ripped out of my original shower) but I didn't want that look, or to be constrained by the dimensions that are available. I wanted a 'custom' shower. Therefore I settled on a "deck mud shower floor" which is made of multiple layers of cement with a PVC liner in between them. I wouldn't call this a starter DIY project, but if you are even a little bit comfortable with working with mortar, it is completely doable by the average homeowner. The quoted price I got for someone to just pour the floor and install the liner (not including any of the previous work I had already completed, or anything to do with the shower walls) was a little under $1000. Yeah. For that money I knew I could do it myself. 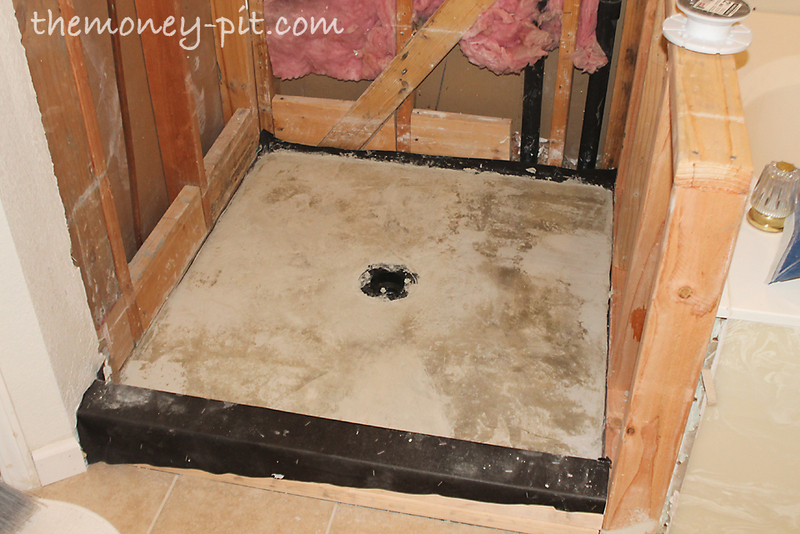 There are a TON of great tutorials out there about how to install a shower floor. The method I used is most accurately described here, here and here. Those tutorials are WAY more detailed than my post is going to be, but I am going to feature the highlights. 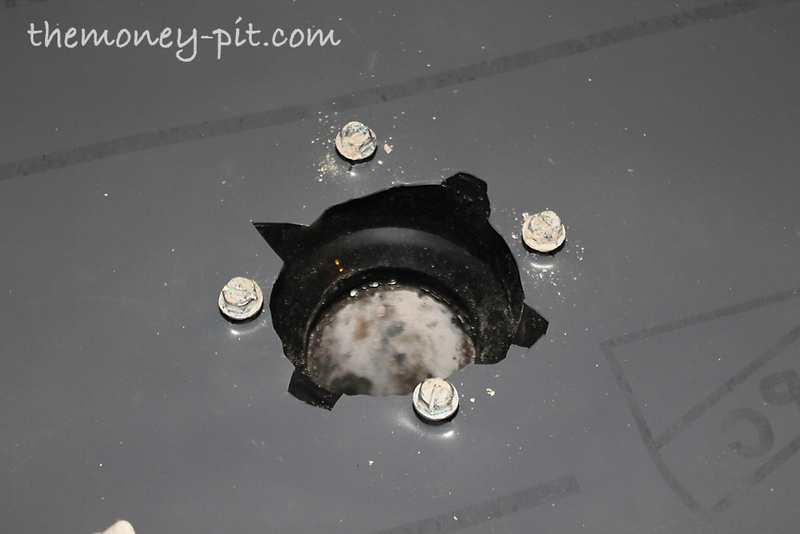 I also installed the drain at this point (not pictured, but shown in the diagram above.) 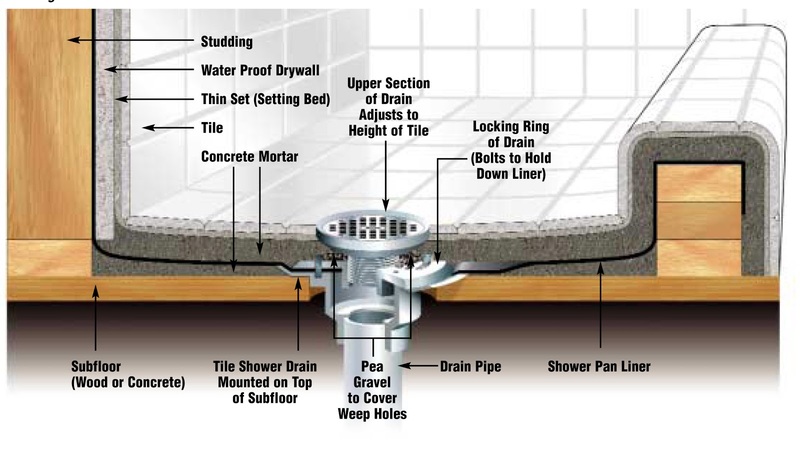 I used a specialty drain which is intended for tile floors which is adjustable in height and includes "weep holes" in the housing to let any moisture trapped in the cement floors to make its way to the drain. I had to cut the ABS line (ABS is similar to PVC but it is black in color) that previously ran to the pre-fab shower pan, and the glue the new drain to the pipe using ABS glue. The next step is to pour the "preslope" or the mortar floor below the liner which MUST BE accurately sloped in order to drive water towards the drain. Although water will never come in contact with this layer (since the PVC liner will go over the top of it) it must be 1/4-1/2 inch higher for every foot between the edge of the shower and the drain. I will make a confession. I really struggled with this step. I used mortar mix to pour the base layer and had trouble getting the slope correct the first time. I spent an entire day ripping out the cement from my first attempt and re-pouring the preslope. This set me back a full day. What I learned from this fiasco was that I should have used "deck mud" (a 1:5 ratio of cement to sand) instead of the pre-bagged mortar mix (which has a much lower ratio, closer to 1:2.) I will eventually pour the final shower floor using the deck mud mixture, since it was 10 times easier to work mix. The sand slows the set up time as well as make the mixture more malleable. For more info about deck mud, see this great post. 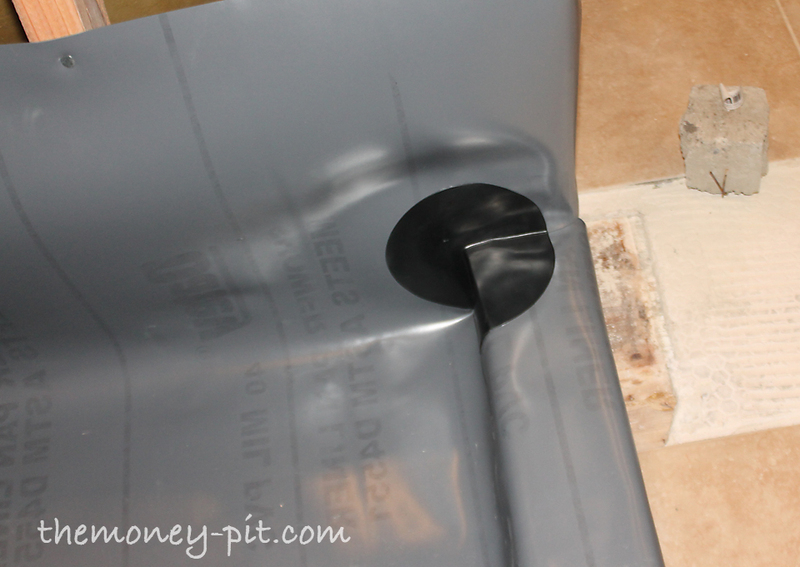 After allowing the preslope to cure overnight, I was able to add the shower pan liner. This PVC membrane is available, by the linear foot, at most big box hardware stores. You want to leave AT LEAST 6 inches up the wall and NEVER EVER EVER put a hole in it. 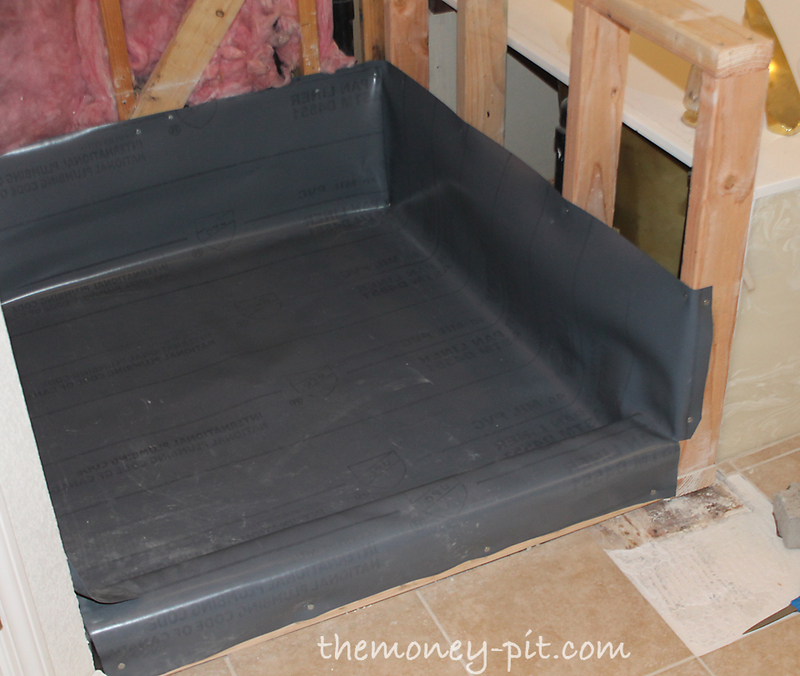 The liner is nailed at the top and outside of the wet areas only. It is not held in place at the bottom of the shower or around the curb by anything other than the cement that is going to be poured over it. 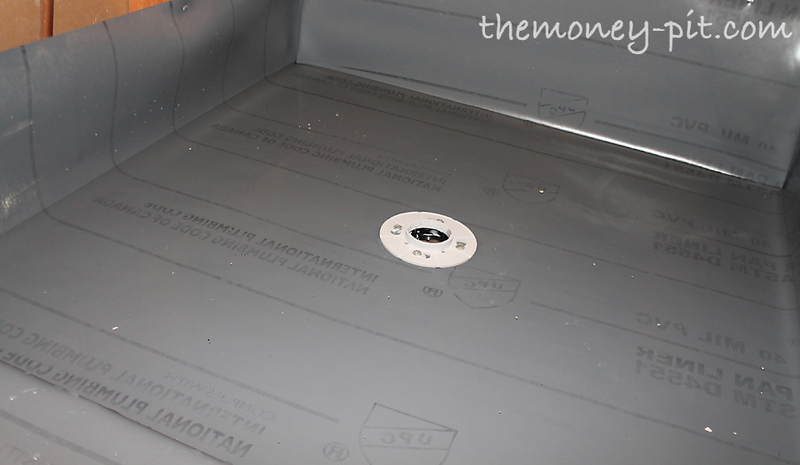 You do have to notch the corners to get around the curb, and you deal with these cuts by using premade corner patches which are held in place by a special PVC liner adhesive. And now the moment of truth. The leak test!! You have no idea how much I was sweating this step. You fill the shower pan with water up to the edge of the curb and let it sit for 3 hours. You don't want to see any leakage which would indicate a tear, bad corner patch or flaw around the drain. It is hard to see, but in this photo the pan is full of water..and turned out to be LEAK FREE!!! Hurray! I also tested my preslope when draining the standing water. You want all the moisture to go to the drain. You don't want any standing areas of water where the preslope may dip or not be the proper slope. Happily all the water successfully drained from my pan so I was very happy. Next up is adding cement board to the walls, pouring the final shower pan and waterproofing the rest of the shower. Little by little we are making progress. Go you! I still can't get over you doing all this yourself!